A gravity sensor game for the GPH Caanoo's handheld console. 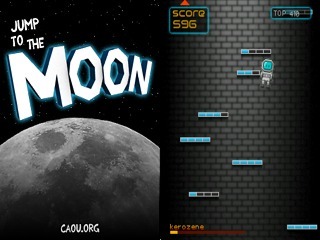 Your litle cosmonaut jumps from platforms to platform while you tilt the Caanoo to give him a general direction. The goal is the reach the moon... And then jump even higher in outer space! That ROCKS ! Highly recommended. This game is fun and addictive. Keep them coming!